Housepets! - View topic - King and Bailey's pups!!!!!!! Okay everyone who is bound to read this i want to hear all your cute thoughts of (oh dog hopefully) soon to be pups! How do you think they're going to look? Re: King and Bailey's pups!!!!!!! Who needs puppies when there's King!? They will be a corgi/husky mix.... small and fluffy. But I guess we will have to see what they would look like IF they happen. If they even have puppies, they would clearly be adorable. I'm not sure Rick wants to introduce babies into the comic though. That's kind of one heck of a shark jump most of the time. We are already waiting for Snows cubs to be shown to us. 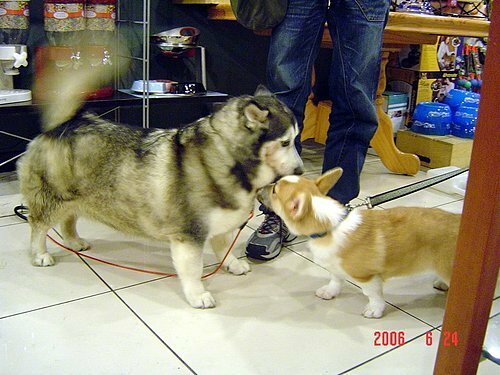 But I really hope that in future we will have little Corgskies running around in Babylon Garden. Look at that blur of a tail, that's a happy dog. I think King's imagined "stubby legged husky puppies" just about covers it. It's only really a shark jump if they're used to offset an aging cast in live action. I don't think the intended audience of Housepets will mind this. They will have the body of a dog and the head of a human. Just because Pete would find it funny. As far as I can tell however he did in fact introduce the pregnancy...though I forgot that wolf's name entirely...and I apologize if it doesn't necessarily make a good enough point.